Not many post posts lately - but a lot of time in the field. 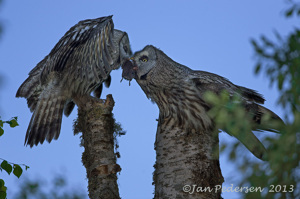 I have followed a pair of Great Grey Owls breeding and bringing up their young's successfully. Deep in the Northern Swedish woods - with tons of blood-sucking mosquitoes and black flies feasting on me. Here the male brings a vole to the female while she is warming the chicks in the broken stem.